Camping in the wilderness always comes with a certain amount of danger, whether real or perceived. But when you’ve pitched a tent at a designated campground at one of the most well-attended national parks in the country, it would suggest a certain amount of safety you wouldn’t normally find elsewhere. The latest story of two teenagers killed by a fallen oak tree branch at Yosemite National Park makes you think again. At around 5 am, campers at Yosemite’s Upper Pines Campground heard a loud bang and then a woman screaming at the top of her lungs. A tree limb from a giant oak tree had fallen right on top of a tent where the two teenagers were sleeping. Details were not vailable as to the names of the victims or what exactly caused the limb to fall. “Our thoughts are with the families as they grieve this tragedy,” stated park Superintendent Don Neubacher in a statement. 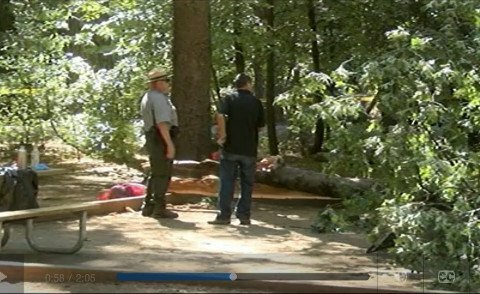 In a similar incident earlier this year, campers in Pasadena were injured by a fallen tree limb. And in 2013 in Yosemite, a camp counselor was killed and children injured by a tree limb at a popular Jewish summer camp. Campers to Yosemite National Park have already been on guard lately as park officials revealed recently that a child had contracted the plague likely at a campground in Yosemite or in Stanislaus National Forest. Park officials have been testing rodents for the plague, which is commonly transferred through flees, and recently found a positive identification near Tuolumne Meadows Campground. As a result they initiated flea treatment in several nearby rodent burrows. So if they don’t stop the spread of plague, at least the rodents won’t be itchy. All in all, Yosemite hasn’t been having the greatest summer. Earlier this year a giant section of Half Dome came crashing to the ground and famed base jumper Dean Potter died on a harrowing leap.